All life as we know it is entirely dependent upon water to survive. The surface of Earth is 70% water, so, too are humans, reaching upwards of 90% water composition. The human brain and heart are considered to be about 73% water, and lungs approximately 83% water. From a molecular point of view, we are in fact 99% water! Without water, we would not exist, yet most of us take this precious liquid for granted. We drink what comes out of the faucet or in bottled form from the gas station without a second thought, and it is not our fault because we are physically incapable of detecting the difference between good and bad water. Sure it might be pure and have added minerals, but scientists are now discovering most human drinking water is considered to be dead, void of any energy. As crazy as that sounds, that is only the beginning of what they are discovering about water’s capabilities. A Russian scientist by the name of Dr. Konstantin Korotkov has developed an instrument that can determine the energetics of water. Anything that enters a strong electromagnetic field begins to emit light. The greater the energy, the brighter the light. He found that ordinary drinking water contained little if any, energy. He was able to compare what we drink to a water sample taken from Venezuela that had no previous human contact. This water was shown to be 40,000 times more energetically active and its crystalline structure near perfection. He concluded that water is a reflection of its environment and it stores that information indefinitely. 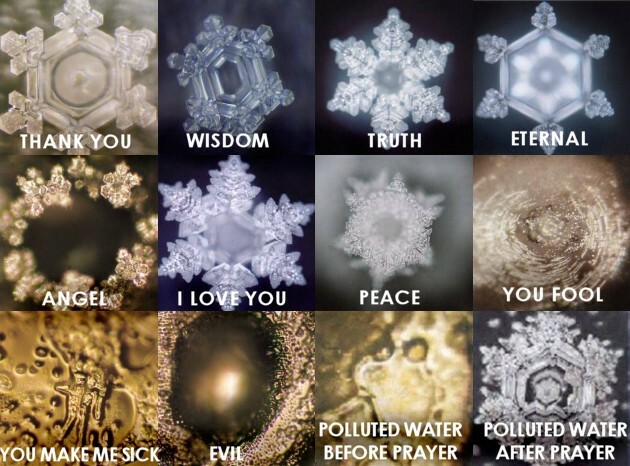 Researcher Masaru Emoto experimented with water by exposing it to music, words spoken, words typed, pictures and videos, and then flash freezing these molecules, he was able to capture and observe under a dark field microscope what that information looks like in terms of a wavelength. In a sense, a photograph of the language of information. 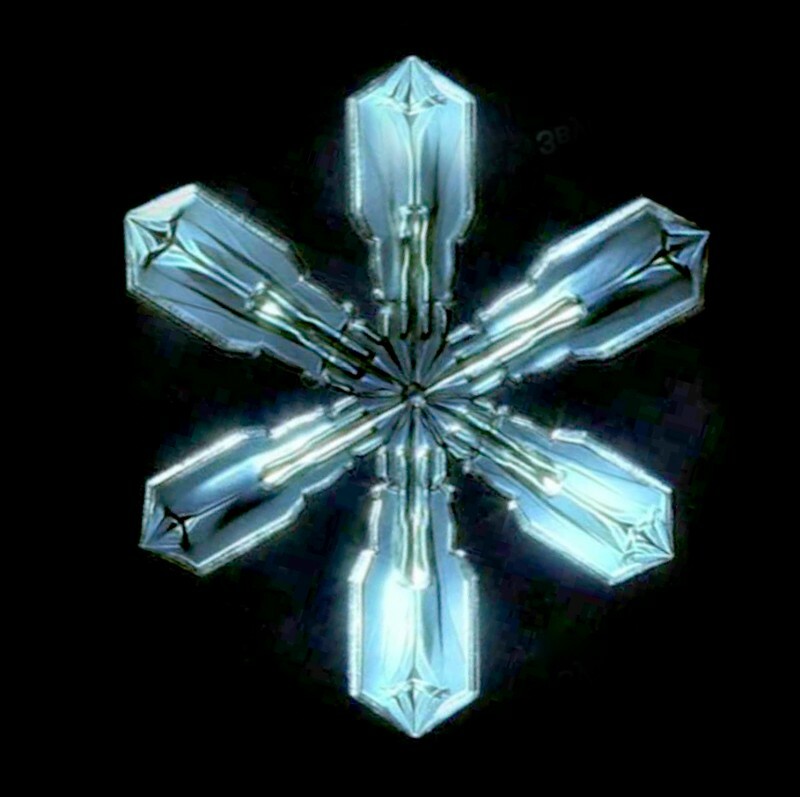 The more harmonic the energy informational structure, the more symmetrical and beautiful the crystal appears, which makes sense if you understand how emotion (e-motion: energy in motion) works in terms of frequency. The more positive the emotion, the higher the frequency and therefore the shorter the wavelength. Emoto performed another experiment in which he set up three beakers with rice and water. Every day for one month he said: “thank you” to the first beaker, “you’re an idiot” to the second, and nothing to the third. The rice in the first beaker began to ferment and give off a pleasant odor. The rice in the second beaker turned black, while in the third beaker it began to naturally decay. Critics of his work believe he lacks insufficient experimental controls and that his results are that of human error. I happen to think that the critics haven’t looked into the physics that backs this up. There is emotion felt behind the vibration of the words being spoken that transmit frequencies. Bear in mind that humans are capable of detecting less than 1% of all light and sound that exists around us. At the quantum level of all atoms exists nothing but balls of light, light vibrating at a low frequency. Everything in your known existence is purely light and sound, and you can barely detect any of it. Dr. La Perla, an immunologist in Nevada, conducted experiments on the blood of patients diagnosed with various types of heart and lung diseases. She noted their red blood cells carried no electrical charge, were all clumped together and unable to breathe in what is known as a ‘Rouleaux’ formation. Twelve minutes after consuming “structured” water, red blood cells taken from the same patients became buoyant, slippery and had regained their electrical charge. Water that had been fed higher frequencies (i.e. positive emotions) healed these red blood cells. Modern technology can now “structurize” water artificially. Results of every experiment utilizing this enhanced liquid continue to show incredible results. Soy sprouts exposed to structured water had six times the photon radiation than that grown in ordinary water (photons react with electrons to create positrons, thereby increasing the rate of evolution of the overall environment). Vegetables ripen faster; the number of useful micro-elements and proteins increased severalfold; 20% less water was needed for crops; no fertilizer was at all needed. In fact, there is already a billion dollar industry centered around structured water. Most of it, as you can imagine, is bogus and they have become the ammunition critics seek. It may possibly begin as structured water, however, it gets packaged in plastic, shipped for some length of time, handled by people who could be displaying negative emotions, basically absorbing everything it interacts with along the way. It is possible though. It is after all utilized by the military. We have the technology to now take water out of the air. Imagine if we could build these along with restructuring units in areas lacking resources. We could end shortages of water and food on a global scale, even provide added methods of healing. I am by no means the first to have this idea. Nowhere in the world is the water the same. It assimilates the vibrations of the soil, absorbing all information within its environment and storing that information forever. There are those who believe that since water stores all surrounding information indefinitely, it could potentially shed light on the birth of the universe. At the quantum level, finding the electron (the particle responsible for the fabric of matter) has proven to be elusive and completely unpredictable. What physicists observed is that molecules behave the way people think; they respond directly to consciousness. At the Institute for Static and Dynamics for aerospace constructions of the University of Stuttgart, students experimented with water utilizing Masaru Emoto’s method of flash freezing water molecules and observing under a dark field microscope. They found that individual drops made by different students varied, while drops made by the same student repeatedly showed a similar image. The frequency of consciousness from the student is what affected the ultimate shape of the crystal. So water can retain all surrounding information indefinitely including thoughts. Thoughts are after all a form of energy and therefore a frequency. They are being generated by your brain, which is comprised of a tight network of nerve cells, all interacting with one another and generating an overall electrical field. The light seen coming from a star and the energy of your mind is considered to be one and the same type. Non-locality, also known as quantum entanglement, describes the ability of objects to instantaneously know about each other’s state, no matter the distance separated between the two particles. This is what Einstein called “spooky action at a distance,” and it drove him mad because he could not put a mathematical formula on it … and it was faster than the speed of light. See most people do not understand that for our laws of macro-physics to work (i.e. the laws of relativity), there has to be infinite energy throughout the universe. We tend to just skip over that part. So water, if I am digesting this correctly, pretty much can detect any frequency pumped through it, store that information forever, and if needed transmit that information throughout the known universe instantly. David Sereda of NASA, along with Russian scientists, has been experimenting with water and the sun since 2008. The frequencies contained within the wavelength of the sun are shown to have powerful healing properties upon the human body and mind, information, of course, numerous ancient civilizations already knew. 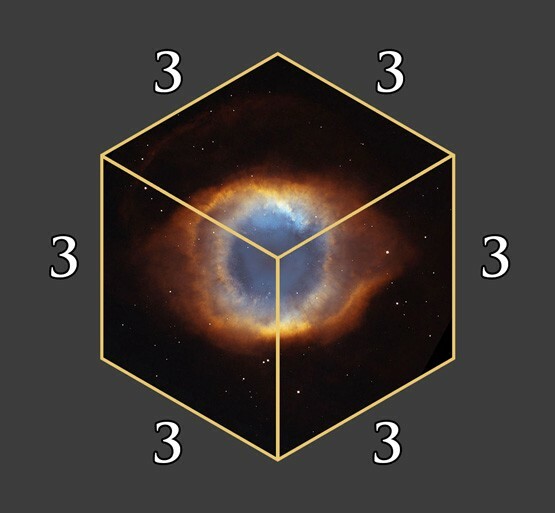 David Sereda also believes that this shape potentially represents the architecture of time as it utilizes shapes of 6, 12 and 24. In a sense, the sun is not just emitting the sound of creation, but also the frequency of time; the primary component necessary for matter to be present, and vice versa. Each cannot exist without the other. Hmmm, so that is why all life is dependent upon the sun. It is “literally” beaming the sound of all creation within the realm of matter. Makes sense that a frequency could be this powerful. As you can then safely assume, the frequencies contained within the wavelength of the sun are shown to have powerful healing properties upon the human body and mind, information that numerous ancient civilizations already knew. So Why is No One Talking About This? Sereda believes that understanding how the hydrogen in water can absorb the information fed to it is the key to infinite energy … Hydrogen fusion … and therein lies why no one has really heard about any of this because it directly competes with the fossil fuel industry. Professor of London South Bank University Martin Chaplin has found that neither a water’s protons nor its electrons are pinned to individual molecules. The hydrogen atoms are mobile and therefore can jump from one water molecule to the next. Hydrogen is the most common element found in the universe and number one and the periodic chart. It permeates throughout everything. Further research into Hydrogen could not only solve our energy issues but help us to understand concepts such as non-locality. Try to imagine what we could then do with that knowledge under our belts. All of this is at our fingertips; we just need to all finally understand the age of fossil fuels has run its course. Notice the structural parameters of not only the frequency of the sun, which is the frequency of time and creation but of every symmetrical tone photographed. 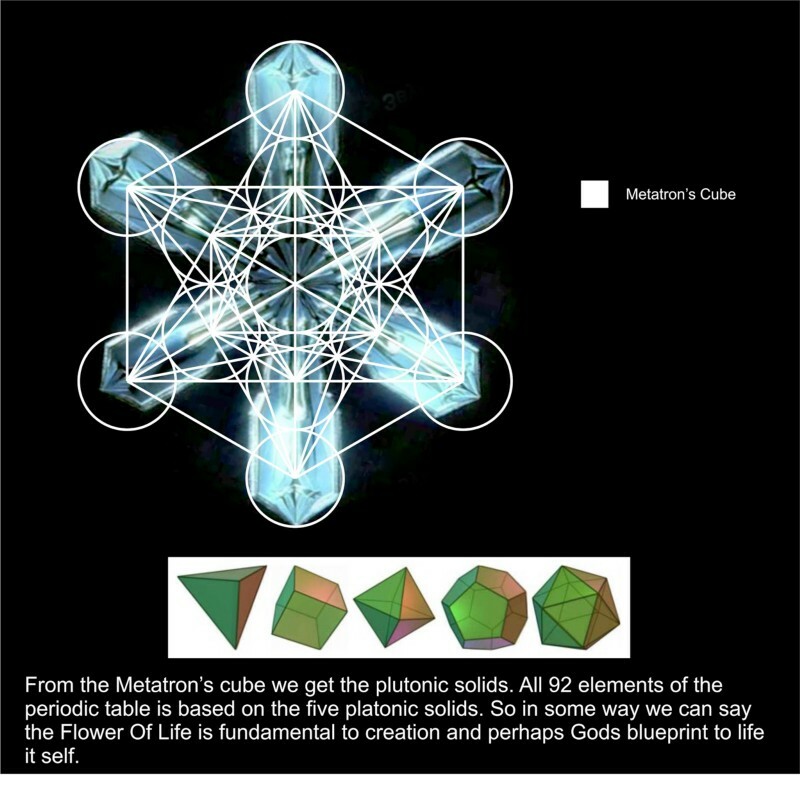 This is where “666” truly comes from: the parameters of matter – the barrier between the 7th and 8th dimensions. Previous articleWhat does Terrell Owens have against the NFL Hall of Fame?